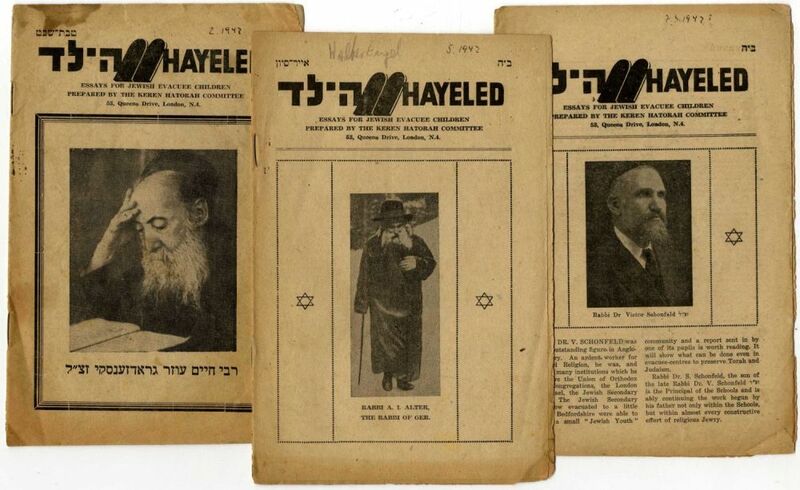 Bidspirit auction | Collection of Issues of HaYeled. 10 HaYeled issues - HeYeled Essays for Jewish Evacuee Children published by Keren HaTorah, London. Various months of the years 1942-1943. There are articles on the topic of mitzvah observance, news on what's happening in the Jewish world, articles about rabbinical leaders. The front page of the May 1942 issue features a picture of the Admor Rabbi Alter of Gur next to an Israeli flag, the front page of the February 1942 issue features a picture of Rabbi Chaim Ozer Grodzinsky. Rare collection. The National Library contains issues published in 1947-8, the issues before us do not appear in the National Library.